A beautiful landscape always amazes people. This is the reason why many property owners would like to unleash the best in their outdoor living space. Designing and building your dream landscape is hard but with the help of professional landscapers, this will become a reality. Reliable landscape contractors can turn your boring outdoors to a magnificent landscape which can be a great attraction in your neighborhood. A simple yet captivating landscape design will be something interesting to work on for most landscapers. However, there are homeowners who want complex landscape designs and are very critical in every detail of landscape development. This is where most contractors fail. Probably, they don't have the required expertise to do the job or lack the equipment and resources to create and install every element in the landscape. To avoid these problems, it is a must that only licensed and reliable landscape contractors are hired for the job. For California homeowners and commercial establishment owners, a landscaping company that they can rely on is Design West Landscaping. Our company is not an ordinary landscaping service provider. We are capable of providing great designs for your landscape. Design West Landscaping will not only create stunning landscape designs but can also delve into building every component of your landscape. Some of our design and build services include patios, fireplace, outdoor kitchens, irrigations, water features, decks, fences, driveways, lighting systems and a whole lot more. Below are some of the reasons why these landscape elements are common features in designing and building great landscapes. Water fountains, ponds, waterfalls, and water gardens are great for giving life within any landscape. They play a very important role in embellishing your outdoor, provided that they are installed at the right locations and the styles are complementing well with your outdoor theme. Fireplaces would be a great place for bonding with family and friends at night. When partying, an outdoor kitchen will surely make everything perfect for the celebration. These components are not limited to any occasion, as they are used extensively in homes nowadays. A fire-pit in a landscape area makes a perfect excuse to spend a warm evening outdoor and it would be perfect to have barbecue while spending all night with the special people in your life. In case you want to be alone, you may take the advantage of the lighting that the fireplaces would provide. Patios are giving a lot of effect on the overall appearance of any landscape. With all the innovations by professional landscapers, they are not limited to specific use. Pavers, on the other hand give texture to the theme of the landscape. Without them, any landscape may look incomplete. 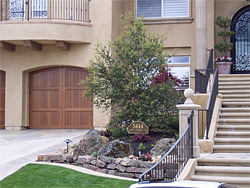 Design West Landscaping is a reliable design and build landscaping company in California. We have a long list of services for any landscaping needs like water features, lighting system, patios, concrete works, fireplaces, and so much more. We are serving both residential and commercial customers in the San Joaquin Valley and the East Bay Area. 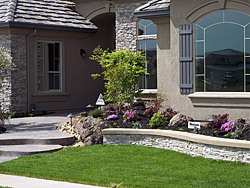 Our more than a decade in the landscaping business is our guarantee that we can provide you outstanding services.